It’s hard to haul yourself out of bed on a chilly morning at sunrise, no matter what the weatherman has prophesied for that day. But there were rewards for our early-birdery. 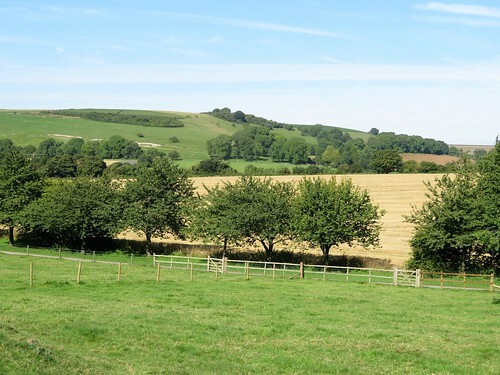 The commuters of West Sussex were still scowling their way to work as we set out from Kithurst Hill along the nape of the South Downs, under a blue sky and with a view that stopped our yawns in their tracks. To the south-west the slender walls of Arundel Castle rose sunlit above their encircling trees, like a stronghold in a fairy tale. The plastic pavilions of Bognor Regis caught the sun, too, and beyond them a bright white ferry crawled past the grey snout of the Isle of Wight over a pale blue sea. 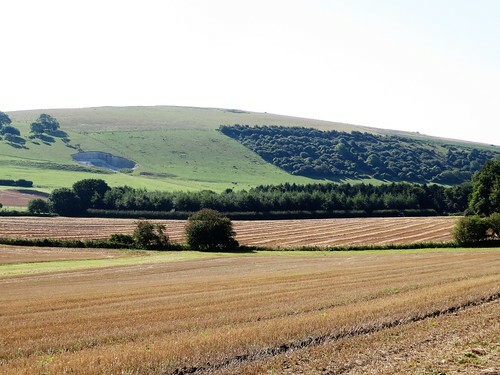 Nearer at hand, the chalk billows of the downs pitched and rolled. 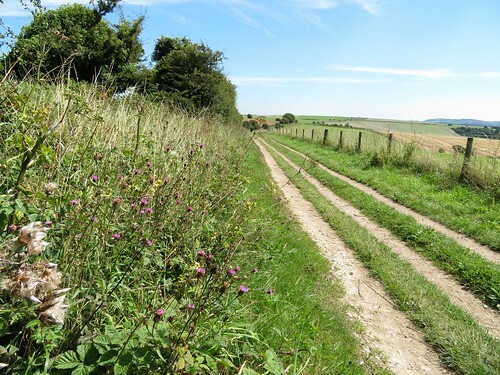 Old trackways and bridlepaths drew green seams through the pale ploughlands and stubble. We picked one running south past a windwhistle copse of beech and sycamore towards Harrow Hill’s green hummocky profile. Harrow Hill might be, as some local stories say, the last place in England the fairies were seen dancing. 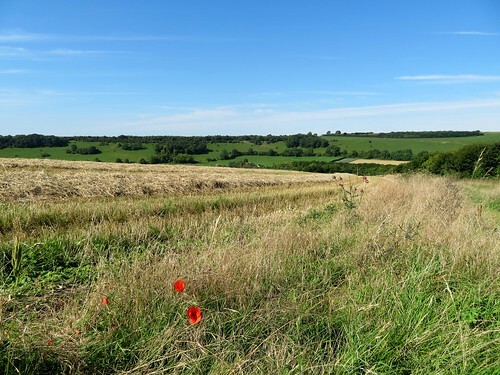 It’s certainly a remarkable piece of chalk downland, pierced and riddled with the deep shafts and subterranean galleries of Neolithic flint mines. The northern flank is hollowed by a giant chalk pit, its sides as cleanly cut as though they’d been cored out with a scalpel. We followed a grassy bridleway that skirted Harrow Hill and ran north beside a hedge of handsomely pollarded old beeches. 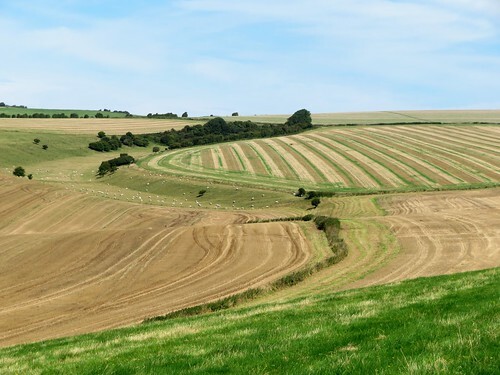 As so often when walking these Sussex downs, we were struck by the immaculate fettle of the land. A red kit quartered the roadless valley that opened below us, the sun catching the burnt orange of its wings as it swung this way and that on the wind. Incredible to think that these lovely creatures were all but extinct in Britain only 30 years ago. 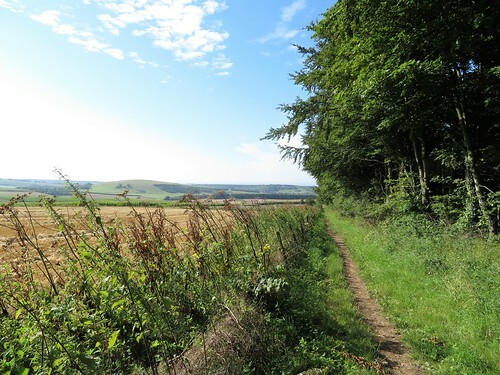 A long straight climb to the South Downs Way at the crest, and time before the homeward trudge to lean on a gate and study the view, fifty miles in sunshine, from the wooded weald of Sussex in the north to the glinting sea far down in the south. Getting there: Kithurst Hill car park is signed at entrance to lane on B2139, 2 miles east of Amberley towards Storrington. Walk (6½ miles, easy, OS Explorer 121): Beside ‘Kithurst Hill Car Park’ sign by car park entrance, go through metal gate, and wooden gate opposite (‘Public Bridleway’, blue arrow/BA). Half left across field; aim right of water tank to fingerpost/FP (073121). 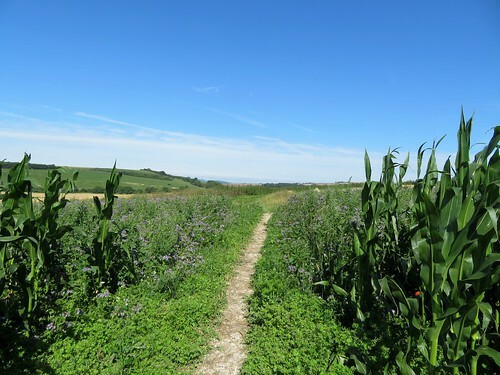 Cross path; follow FPs and BAs for 1 mile to Lee Farm (076104). Left; where drive swings right, ahead through gate (078103, BA). Right across field, through gateway (078099), up rising track. 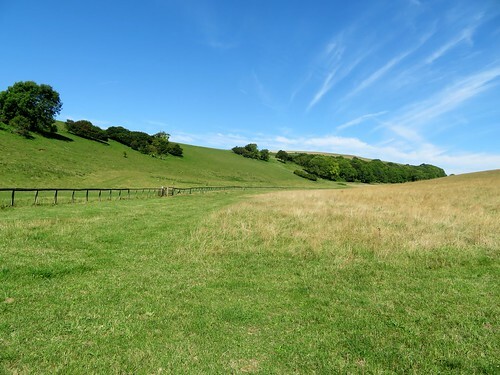 Gate (BA); grass track; in 150m fork left across field for ½ mile to gate (082093). Ahead down drive; in 250m, left through gate (084090, BA). Half right across pasture; at KG and FP, left (086090) on gravel track. In 400m fork left (087092) on fenced grass bridleway. In 500m fork right through gateway (089098); ahead across pastures. In ⅔ mile, through gate (090105); in 100m, right (gate, FP) on bridleway. In 300m, left (093109, BA) for ½ mile to SDW (093117); left to car park.